Last September, I went on a 12-day trip around some places that I have been wanting to go to around Asia with my sister. It was a long shot when I first thought about this trip. We only had less than 2 weeks to plan when we decided to push through – it was definitely worth it! Our first day was technically our “rest day”. We flew with Singapore Airlines from Manila to Yogyakarta via Singapore. I would have wanted to leave the airport to get some chili crabs from Jumbo but decided to stay inside instead. From my last visit (which was last May 2015), I noticed that they already renovated the food court. You can even order from any of the stalls through a vending machine. From our early morning flight, it was already 5pm when we arrived in Yogyakarta. It was almost 7pm when we finally headed out from the airport. The line exiting from the baggage counters to the immigration took awhile; something I definitely did not expect. We stayed at Inna Garuda for our first night. For one, this hotel was built in 1908 which definitely has some history behind it. It is also strategically located in Malioboro Street which is probably the most popular area to go to in Yogyakarta. Our visit was timely as they were celebrating Eid al-Adha so there was a lot of happening around the city. The first stop we went to was to try some Kopi Joss (Charcoal Coffee) from Angkringan Kopi Joss Pak Agus. This drink literally has a hot charcoal dunked in your coffee. It is said to have some health benefits from the activated carbon of the charcoal. We also tried some of their chicken satay which was our first meal in Yogyakarta. Keep in mind that most (if not all) establishments do not serve pork as with all other Muslim countries. I had to learn this the hard way as I kept forgetting about this and would sometimes ask if they had pork on the menu. Same thing happened when we visited A&W in Surabaya on Day 5. I was craving for some Coney Dog but of course… Definitely my bad! How to get here: go to the opposite direction of Malioboro Street and you will find a train track. 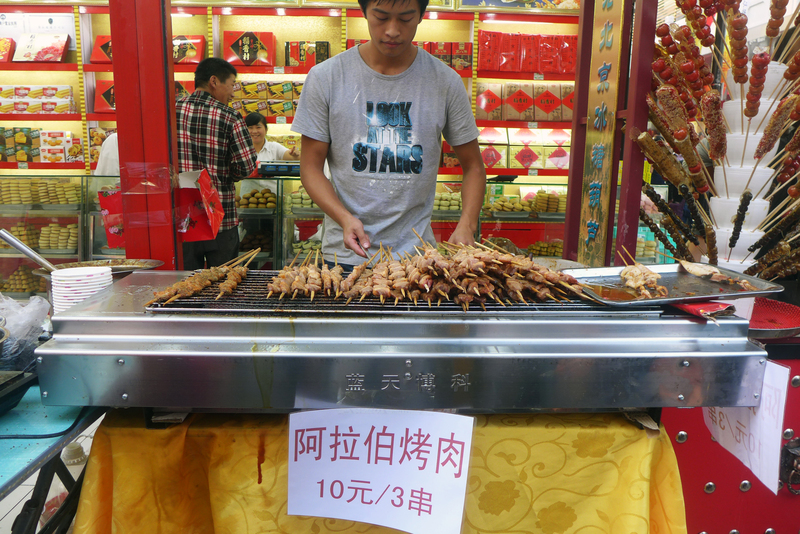 Keep walking ahead and you will see this establishment to your right along with other stalls and street vendors. Afterwards, we headed back to Malioboro Street and walked around for a bit. There are a lot of side streets that you may also want to check as well. We ended up in one of those to try some more local food. My sister really enjoyed trying out new dishes but I was the complete opposite. I have a bad tolerance for spicy food which is why I even forgot about taking a photo of where we ate afterwards. I did enjoy some of the Indonesian dishes we tried in the latter part of the trip as long as it was not spicy. We ended up going to a mall close by so I can order some McDonald’s to go before we headed back to the hotel. It was probably around 10pm at this point and our call time was at 4AM the next day. Little did I know that 4AM was already late compared to the time we had to wake up for the next few days. We asked for it! After a much needed rest, Day 2 might be the best and most memorable day of our trip. We started our day by doing some creative shots along the hallway of Swiio Hotel. There was a cleaning service on our hallway so we had to move to another floor to take some post worthy shots. For lunch, we headed to Addiction Aquatic Development. I was lucky to stumble on this place just a few days before our trip. They said that this was somewhat like the Tsukiji Market of Taipei. I have been to the latter as well so that information might be misleading. Nonetheless, we really enjoyed our time in Aquatic and would definitely recommend that you visit this place! When you enter, you are first greeted by the huge open tanks filled with all sorts of seafood. Majority of them contained huge king crabs as well as other shellfish. Here, you can buy live seafood on a wholesale level. As we moved further, we are greeted by a supermarket type section filled with all sorts of dried and fresh seafood. Likewise, their supermarket area also sell some meat, vegetables and other gourmet food. The middle section is where all the action takes place. The outer area contains the seafood bar while the middle area is where the sushi bar is located. We had to queue and our number was around 160+. Also worth mentioning is the hotpot area located on the upper floor and an outdoor BBQ area when you exit. We decided to try their bar section while waiting which offered wine and sake. You can also order some fresh oysters which we did not get and opted for the cheese platter instead. My girlfriend ordered some white wine while I had some cold sake. After more than an hour of waiting, it was sushi time for us! A bit unusual but both the seafood and sushi area are both standing areas only. They probably configured it this way to maximize space. We tried several dishes such as monk fish liver which is said to be the foie gras of the sea. It was delicate and creamy but I was not very fond of this dish. Also, on our table were some green sea urchin, both local Taiwanese and Japanese fatty tuna, clam soup and a sushi platter. My favorite were both the Japanese fatty tuna and the sushi platter. Both were yummy! Too bad the more premium Taiwanese toro was not available at that time so it was hard for me to compare both cuts. Lastly, we also tried some grilled king crab legs which we squeezed some lime on top. I would definitely come back for more of this! Definitely a great and memorable food experience during our visit at Aquatic. I can attest to what people say that the best Japanese food outside of Japan is here in Taiwan. After our sumptuous meal, we headed to take the Maokong Gondola. We decided to head to the last station which was aptly called Maokong Station. Here, you can see great views of Taipei from a mountainous location. We did not really have a plan when we arrived at the last stop so we ended up walking a bit before ending up in a tea place. We ordered some local tea served in a traditional way. We spent more than an hour just serving each other some tea. We probably had 12-14 tea cups each before we headed back to look for some premium Taiwanese tea to bring home. We ended up in a tea shop which prides themselves as being a distributor and direct from source shop, we did not expect to have another round of tea drinking before we purchased some High Mountain and Dong Ding tea. Definitely better than the one we tried before and we were given some tea 101 by the son of a tea master. At this point, we had so much tea in our system that it was already time to return to the city. It was already sundown when we rode the cable car back to the city. My night shots were horrendous as the cable car was constantly moving. One big reason why I will do Elephant Mountain for my next Taipei trip. For dinner, we headed to our favorite night market – Raohe Night Market. 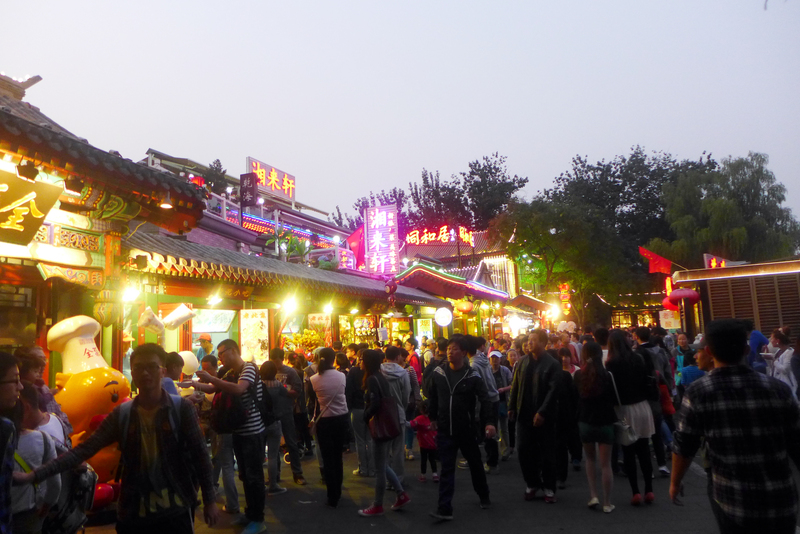 It was the same great night market that we visited last March which we really enjoyed. We tried several dishes that we did not eat before like the grilled abalone, grilled corn, matsusaka pork and boiled clams. The matsusaka pork was very tasty but my favorite find is the grilled corn which had some sweet coating on the outside. With our tummies full from another great Raohe Night Market experience, we decided to visit the Rainbow Bridge. I was quite disappointed to see that the bridge was not lit up. I just ended up taking photos of an unknown bridge on the opposite side. Today marks our last day in China. After a long Day 7, we still ended up heading to a club later that night. We had a few drinks and partied for a couple of hours. We started our last day a bit later than the usual. 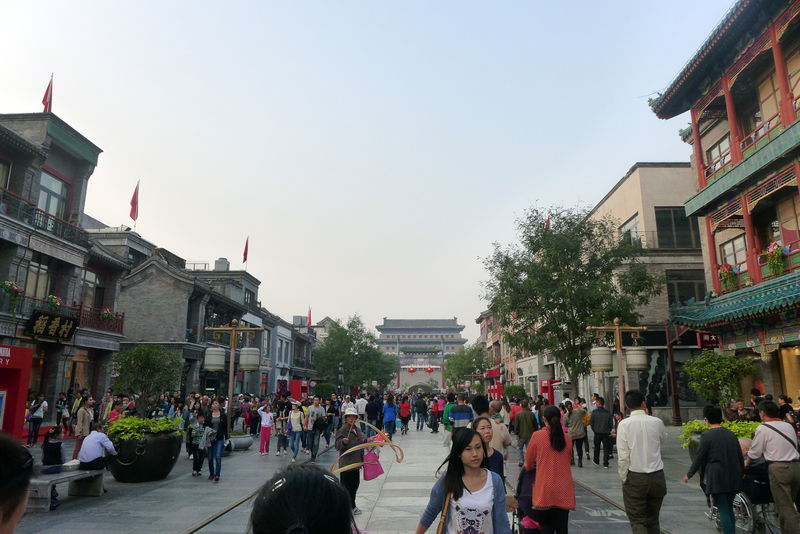 Our first stop was Qianmen Street which is just a walking distance away from Tinananmen Square. The place has an old-style to it due to it’s design. However, the shops along the main street are all modern. We went to the side streets to grab some lunch in one of the restaurants. Food was just okay. After lunch, some of us tried some yak meat (I think it was!) while the others tried some candied desserts. I wasn’t that fond of the yak meat. It was tough and very intense in taste. 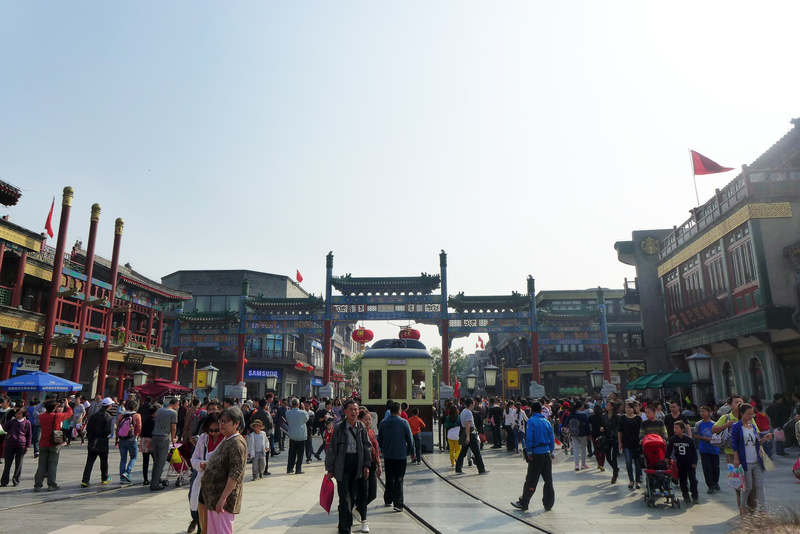 Late in the afternoon, we moved to Houhai. We hanged out for the rest of the day here until sundown. 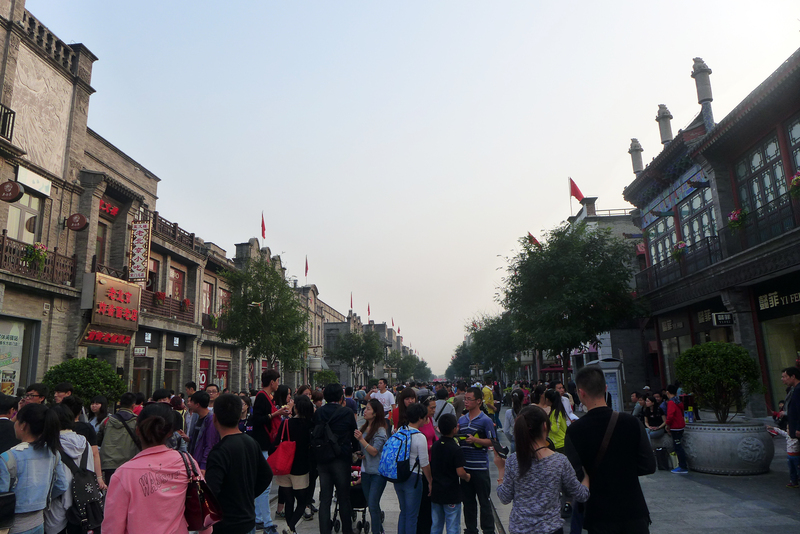 The place was packed just like Qianmen Street. Lots of street food and other things to try out.